Spiritual Themed Taylored Expressions Cards! Today I have two Spiritual themed cards for Taylored Expressions and I have used watercolour technique to create backgrounds for these cards. The cards have different technique used. So here is my first card. //embedr.flickr.com/assets/client-code.jsI first started with die cutting watercolour paper using the largest stitched rectangle die from Stitched Rectangle Stacklets die set. Then I Gold heat embossed the He is God stamp on the centre of the watercoloured panel. 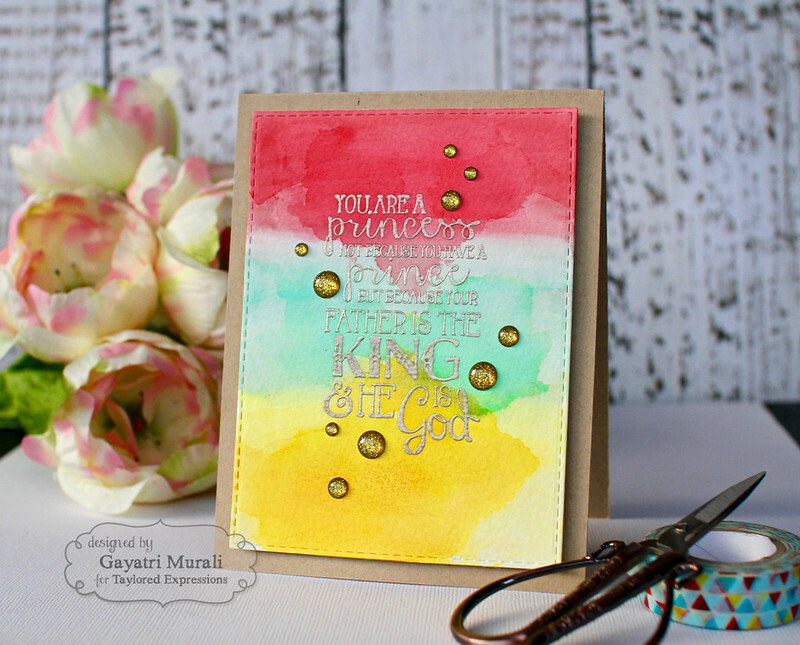 Then I used the brush stroke image from Stroke of Genius 2 stamp set to stamp on the background using Granny Smith, Strawberry Milkshake and Lemon Meringue TE inks. I used my mini MISTI inks to get a good impression of the brush strokes as I was stamping over embossed images and on watercolour textured paper. Once dry, I used distress inks Mowed Lawn, Abandoned Coral and Mustard Seed to colour wash behind the brush stroke images. I let the panel dry. 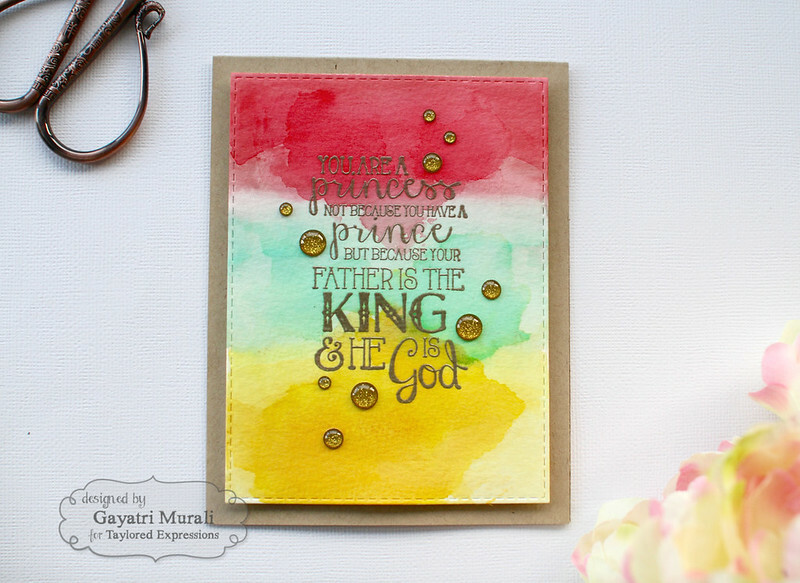 Once dry, I was not happy with the gold embossing as it got lost in the background. So I used my black fineliner to add outline to the embossed images. Now the sentiment stands out againsts the watercoloured background. 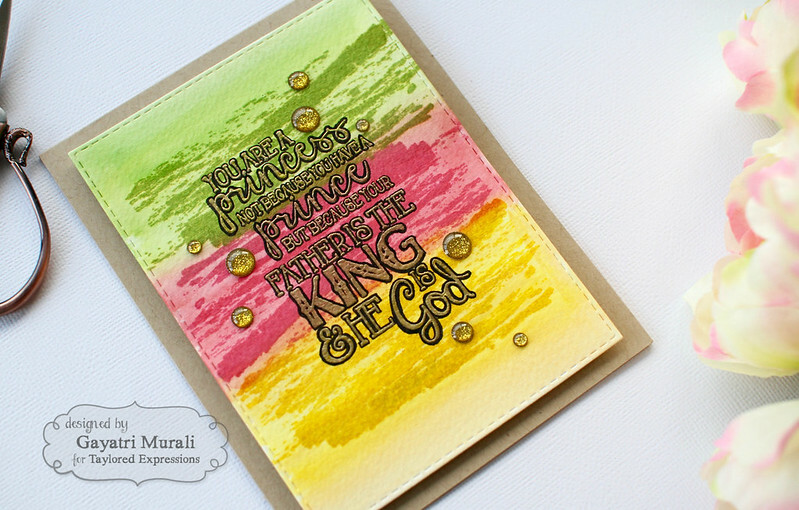 I love the brush stroke stamped image giving texture to the background. I mounted the panel on Toffee card base using craft foam. Finally added some gold enamel dots. I like the sentiment be the focus of the card. For the second card, I embossed the same spiritual sentiment on watercolour panel die cut out of the largest stitched die from Stitched Rectangle Stacklets. This time I embossed using Liquid Platinum powder. For the background, I first used Gansai Tambi watercolour to do a light watercolour wash. Once dry, I wanted to add layers and intensify the colours. 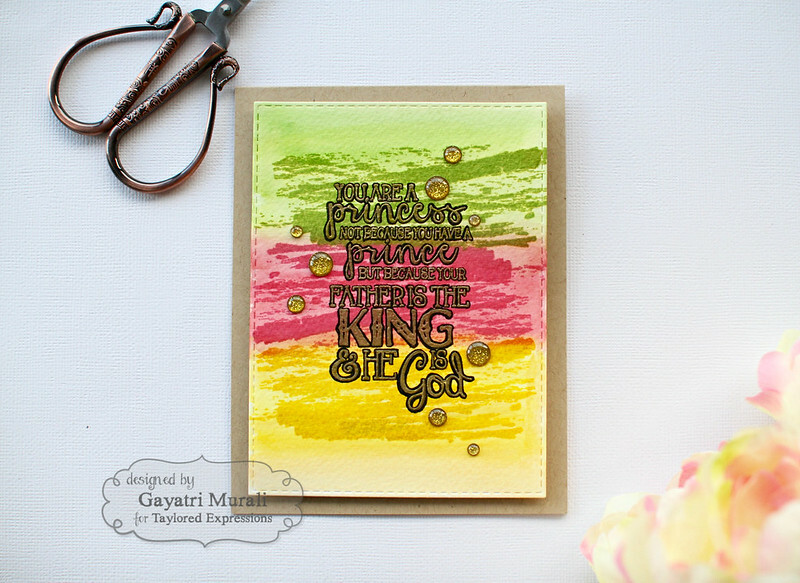 So I used distress inks, Candied Apple, Cracked Pistachio and Mustard Seed to do ink smooshing technique. I love the soft and hard edges and layers of colours. The platinum embossed sentiment is soft yet pops against the background. So I left it as it. No outlining the sentiment.Again, mounted the panel on Toffee card base using craft foam. Embellished with gold sparkle enamel dots. Hope you like the two watercolour techniques. You can get that layers of watercolour in two different ways. And you can use two different mediums to add layers and get the colour intensity. This techniques particularly works if you have a big bold sentiment for the focal point. All the supplies I used to make my cards are listed below. Check out Taylored Expressions store for all the new August new release products. They are available for purchase. Your cards are so beautiful. Love the words. They are both amazing, but I think it was genius to use a black fineliner to outline the sentiment… I may have to try it myself, thanks for sharing! Oh, wow!! These are gorgeous!!! 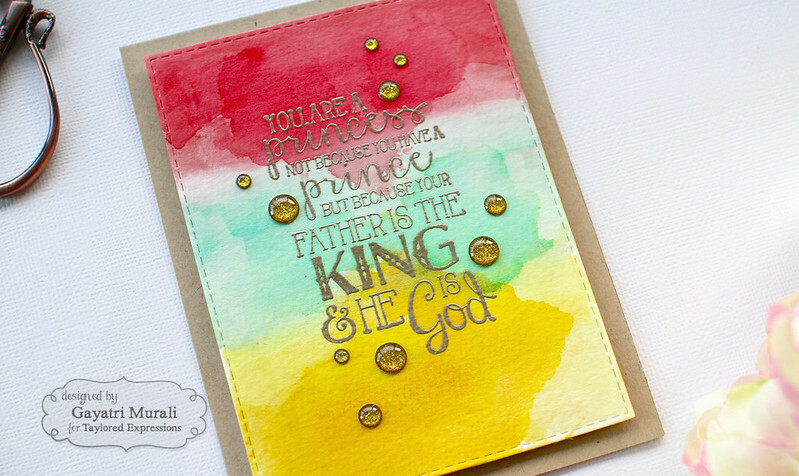 I love how you highlighted the gold lettering with black on the first card. The sentiment is so beautiful!!! I need to check that out. I am facilitating a Bible Study this fall and this would make wonderfully encouraging cards for the ladies! They're both gorgeous, but I especially love the second one! 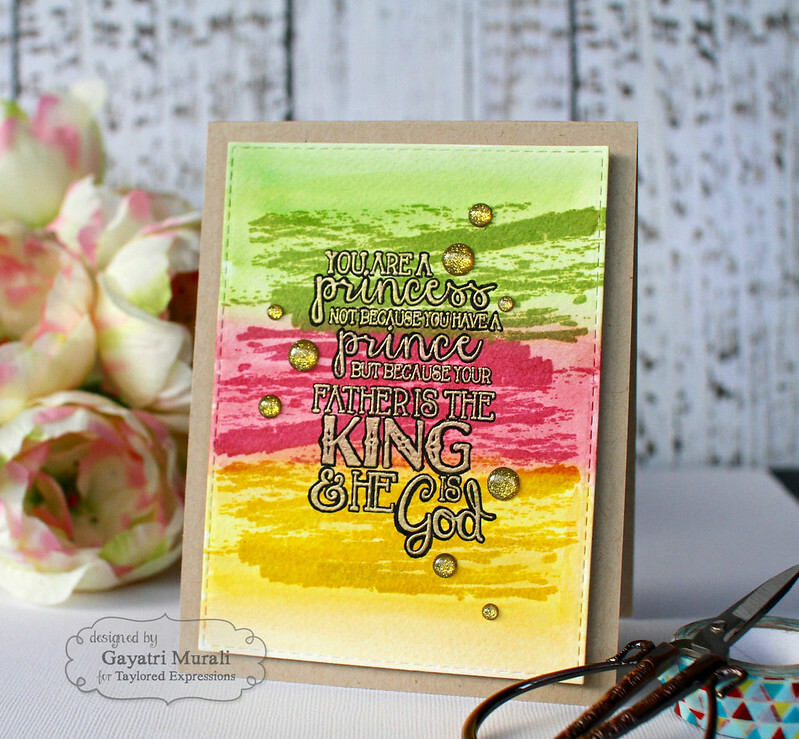 Love the look with the addition of the Distress Inks!